The UK risks facing a growing crisis with the quality of the electoral register, Toby James argues. He draws from his research to suggest that a proposed amendment to the Wales Bill could make a substantial difference and should be supported by those concerned about democracy in Wales and the UK. 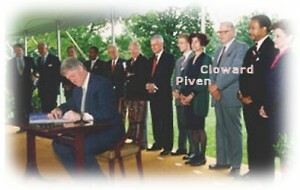 President Bill Clinton signs the ‘Motor Voter Act’ in 1993, with activists behind him. A number of important pieces of legislation that change elections in Britain have already been passed by the Coalition government. We’ve had an AV referendum, (postponed) boundary reform and the Fixed Term Parliament Act 2011. Another one might be coming, but it is one that you might not have heard of: the Wales Bill. The main focus of the Bill is to further the process of devolution in Wales, but amendments to the Bill, which will be voted on in the Lords on 11 November 2014, will make changes to how the electoral register is compiled in Wales (with implications for the UK). The electoral register is usually an overlooked area of the constitution. We assume that it is an administrative and technocratic issue. In an ideal world, it perhaps would be. All eligible citizens (and no one else) would have their name added to the register in an entirely accurate way. Public policies, however, are never implemented in an ideal, hypothetical world. Compiling the electoral register is an enormous logistical task and there are many challenges facing electoral registration officers (EROs), whose job it is. They need to maintain lists of increasingly mobile, eligible citizens within their local authorities. The chosen method for compiling the register, door knocking, has become less effective over time. The people who they are trying to add to the register have become more disengaged with traditional politics and are therefore less likely to want to register, let alone vote. They have to do all of this on diminishing budgets. And budget size, as Alistair Clark has shown, can affect their ability to meet central instructions. There are also difficult political choices to be made. Should we prioritise having an electoral register which includes everyone? Or should we focus limited efforts and resources on making sure that those names that are on the electoral register are not duplicates or even worse, bogus voters. Naturally, we to do want both. But with finite time and resources, which policies and reforms should we back? In choosing how the register is compiled hard choices have to be made. The Coalition government has prioritised reducing opportunities for fraud and not maximising a complete register. It fast tracked the implementation of individual electoral registration (IER) which will require citizens to register individually and provide their national insurance number. Their name will then be checked against government databases before they can be added to the electoral register. At some point after the 2015 general election, those who have not re-registered will be wiped clean from the register. One top-end estimate is that 5.5million people could be affected (this assumes no-one will re-register). This may exacerbate the growing crisis that has emerged with the quality of the electoral register. Voter registration rates have dropped substantially even before the introduction of IER. The registration rate is estimated to have fallen from approximately 95% of the voting age population in the 1950s and 1960s to 82.3% in 2012. The good news is that there is a solid body of research which shows how voter registration rates can be improved. Back in 2010, in the journal Representation, I detailed a menu of reforms that states could choose from if they wanted to improve electoral registration and voter turnout by changing simple administrative procedures. More recently, in May 2012, I prescribed on the Electoral Reform Society blog, how some of these could be used in the UK to offset the decline in voter registration that IER would bring. Thankfully, some of these have been implemented. We now have online electoral registration, extra funding for EROs to cover the short-term implementation costs and a public awareness campaign. But not all. UK electoral registration could be improved by a ‘Motor Voter’ Act. Such an Act was passed in the USA in 1993 at the federal level. It expanded the number of locations and opportunities whereby eligible citizens could apply to register to vote. In particular, citizens were to be given a voter registration application when they applied for or renewed a driver’s license (hence ‘Motor Voter’), or when applying for (or receiving) services at certain other public offices. The amendment has been campaigned for by the vibrant pressure group Bite the Ballot in their #TheAmendment campaign. They suggest that while this ‘leaves open the exact content of the regulations, it does include some government bodies that must automatically provide information to registration officers; namely, the Driver and Vehicle Licensing Agency (DVLA), the Department of Work and Pensions, the Passport Office and the National Health Service’. All four Welsh party leaders—Carwyn Jones, Andrew RT Davies, Leanne Wood and Kirsty Williams have signed up to them. The thinking is, if this works in Wales, the rest of the UK could follow later. If this was to be implemented in the UK, there might be a further resources issue. EROs have faced significant challenges with the move to individual electoral registration and if they are required to use a further resource then this will involve further work. They would need further resources to do this. Despite this, the principle of a UK-style Motor Voter Act must be supported by those concerned about democracy in the UK. Rather than relying on disengaged citizens to be proactive in registering, we can ‘bring the mountain to Mohammed’. A simple tick box form can be added to government forms so that citizens update their electoral registration details when they access more pressing everyday services. Or data can be automatically transferred from other government databases. Unlike politicians or political scientists, most people don’t think about the forthcoming election everyday. They do think about their car tax, benefits or health care. EROs will be provided with a rich source of information that they can use to update their registers. This could make a major difference. Today, nearly one third (32.4%) of registrations are submitted in the US at motor vehicle agencies. Some studies suggest it raised turnout by around 2 percentage points and Frances Fox Piven and colleagues argued that the results could have been even better with improved implementation. We should not let this opportunity pass. Toby James is a Senior Lecturer in British and Comparative Politics at the University of East Anglia. He his book on the politics of election administration in the UK, USA and Ireland was published by Palgrave in 2012. He has since published many pieces including an article on the likely impact of individual electoral registration in Parliamentary Affairs and a book chapter on the challenges that electoral administrators face in the UK in Advancing Electoral Integrity (Oxford University Press) and on the impact of the UK Electoral Commission’s performance standards scheme, which is designed to improve election administration. Jessica Asato: ‘Authenticity and independence: are they compatible with British party politics?